The Timbaktu Collective, a winner of the 2017 Spring Prize. The Timbaktu Collective works for sustainable development in the drought prone Anantapur district of Andhra Pradesh (A.P.) in India. The Collective works in over 172 villages of Chennekothapalli, Roddam and Ramagiri mandals of Anantapur district, reaching and serving about 20,000 marginalised families. The Collective works with some of those most affected by chronic drought, unproductive land, unemployment and poor infrastructural facilities in the region. Among them are landless people and small and marginal farmers, with a special emphasis on women, children, youth and dalits. ‘Timbaktu’ means ‘where the earth meets the sky’. Vision: Rural communities take control of their own lives, govern themselves and live in social, gender and ecological harmony while maintaining a sustainable lifestyle. Mission: Enable marginalised rural people, landless labourers, and small and marginal farmers particularly women, children, youth, dalits and the people with disabilities, to enhance their livelihood resources, get organised and work towards social justice and gender equity and lead life in a meaningful and joyous manner. restoration of waste lands; organic farming and marketing; alternative banking, credit creation, legal aid and counselling for women; child friendly education and spaces; livelihood through animal husbandry; and disability support. As part of its strategy, the Collective has formed numerous village-based organisations for the rural poor, promoted producer owned mutually aided business enterprises and revived the Cooperative movement. Values: Celebration of Life; Faith in people and their wisdom; Cooperation; Excellence. February, 1990: 32 acres of barren, degraded land was purchased by the founders of Timbaktu Collective. December, 1991: Masanobu Fukuoka’s “One Straw Revolution” translated into Telugu. This created a core text so that Fukuoka’s approach and permaculture were the basis of much of the regeneration work. A percentage of the book’s sale price helped to start a fund to plant and care for trees. January, 1998: Adisakthi Mutually Aided Thrift Cooperative Society (Adisakthi), the first women’s cooperative of the collective, with 1,466 members – a key point for understanding the need for organic farming training. November, 1998: Organic farming experiments were initiated on a demo plot at Eetavanam, through which they learnt and understood what works and what doesn’t in the local ecosystem and what efforts are really needed. 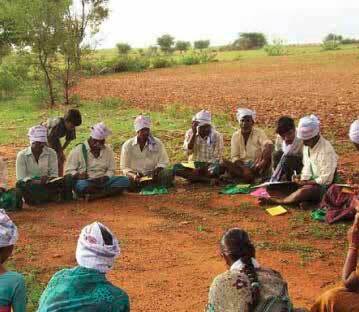 November, 2005: Organic farming groups were initiated in 8 villages with 300 farmers. Throughout the project, working with and helping to establish and grow women’s groups, and working with children and schools, has been critical to the Collective’s growth, success and effectiveness. Community participation and ownership is the underlying theme. Seeding and growing effective systems of organisation (i.e. cooperatives) that address the food, economic and social needs of specific disadvantaged groups. Long term education systems that enable personal, community and environmental change, founded on specific techniques that enable the regeneration of degraded land. Building social capital amongst and with some of the most marginalized communities in Southern India. Regenerating more than 9,000 acres of community common lands into biodiverse savanna grasslands and tropical thorn forest. “In the beginning when I had just sown my field everyone who saw my farm mocked me, they were all dismissive. But as my crops neared harvest and my land appeared lush and green, passers-by wanted to know what I was growing! Golla uses Neem leaves for its antibacterial properties, and Thorn Apple and Swallow Wort leaves for their pest and insect repellent attributes. When the project started, the ravaged and ruined soil was as hard and unforgiving as concrete, so degraded that not even a blade of grass could grow. Robbed of the ability to produce food, the region suffered widespread debt, poverty, food insecurity and malnutrition, resulting in nearly 700 farmers committing suicide in the space of ten years; a monumental crisis in an already sparsely populated part of the country. How it is done with people: The social work that Timbaktu has done was essential to do first, to be able to get the land work off the ground. In particular, breaking down social stigmas (cast, womens’ role and access to finance, representation at meetings, etc) was a key part of the work. To create an alternative education system which focuses on experiential learning while also teaching the conventional Indian syllabus in the Collective’s school (which enables progression in wider society), as well as additional subjects and activities such as local dance, agriculture, craft, ecology, music etc. How it is done with the land: ‘if it works for farmers it works for us’, not aligning to one technique or movement. Protection: Protecting the soil and plants temporarily by fencing it with thorn bushes, and explaining their efforts to trespassers, has stopped grazing to a great extent and tree cutting almost totally. For larger tracts of land, the approach has been to focus on ‘social fencing’ measures, where physical barriers are not used. Fire Fighting: Deliberately burning 15 to 20 ft wide fire lines across the hills as a grid, prevents fires from spreading uncontrollably, coupled with building awareness among the villagers about reducing fire risks. Rainwater harvesting and soil conservation: Initially, small earthen bunds and small rock-filled check dams were made all over the land, to plug gullies, reduce the run-off and keep the water on the land. Later bigger check-dams and rock-filled dams were built along the larger streams, to save as much rain and soil as possible. Revegetation: Thousands of trees have been planted, with pits dug, natural manure applied and better soil added to the pits, to help small plants establish themselves. The survival rate has now reached 85%. Protection and non-disturbance has also enabled the existing plants and grasses to propagate themselves. Seed Collection: A seed collection initially stocked about 120 key tree, bush, herb and grass species to distribute and plant during the rainy season in regeneration areas, to test their viability for providing green cover for economically productive species. The Collective follows the principle of ecological succession and has observed its effectiveness over the years. Kitchen Gardens: Kitchen gardening and bio-intensive gardening is a regular activity in Timbaktu especially by the children of the residential school, and provides a valuable contribution to the nutrition of the children. Methods of composting that suit the area provide excellent fertiliser for the fruit trees and vegetable plots. Farming: The collective has leased land where various natural and organic farming practices are being trialed. The Collective aims to and has learnt from the farmers’ traditional knowledge, acquired over many generations, and has developed new approaches with them. Women’s Cooperatives: Mahasakthi federation of Cooperatives (also a registered Cooperative) with 4 member cooperatives – around 22,600 members and a total capital base of around 240 million Rupees. Tree-growers’ Cooperatives: Kalpavalli treegrowers’cooperative has regenerated 9,000 acres of barren community common lands into a community managed wilderness, home to endangered species such as the Indian Grey Wolf and providing livelihoods to over 1,000 people. Farmer Cooperatives: Dharani, a federation of farmer cooperatives with over 2,000 members that procures, processes, value adds, markets and sells members’ produce, with revenues around Rs. 30 million. Cooperatives of People with Disabilities: Prathibha, a Mutually Aided Thrift Cooperative Society of people with disabilities with 1400 members. It provides loans to its members at reasonable interest rates along with health and rehabilitation services. Children’s Cooperatives: The Collective runs a small residential school for disadvantaged children and a resource centre for children and youth. It is working in 48 villages to educate 2,024 children (including 918 girls) and their parents on children’s ecological rights, helping them set up 31 community vegetable gardens. Enabling Rural Enterprise: The collective has established two new enterprises. Bhavani is a livelihood initiative for young rural women who are high-school dropouts, disabled, widows, abandoned by their husbands or from difficult backgrounds. It is a vibrant group with nine young women who are establishing a market for themselves. They spin, dye and weave pure khadi handloom sarees and material with a range of natural dyes such as anar (pomegranate rind), alizarin (rose madder), katha (catechu from acacia), rattan jyoti (alkanna tinctoria) and indigo. Prathiba is a cooperative for people with disabilities and has established a handmade soap enterprise as a model for livelihood generation. • A large number of trees and other plants create a sharp contrast to the barren lands and hills nearby – in summer much of Timbaktu and surrounding hills remain green and are full of wildlife. Groundwater level in wells has risen from 50-60 feet below ground to 20-25 feet. • Monitoring shows that soil quality is steadily improving, trees are healthier and plant types have changed. Species diversity increased rapidly initially, and plant diversity has now stabilised at about 320 species. • Bird diversity has increased from about 40 species in 1992/93 to about 240 species now. 76 species of reptiles, amphibians and mammals can be found in Timbaktu and surrounds. These include leopard, sloth bears and endangered black buck antelope. From patterns to details: patterns of organisation that can be repeated, so that the detailed needs of particular groups or issues can be addressed by their own cooperatives (as economic organisms) at the local level. Removal of limiting factors: removal of key limiting factors for women (e.g. legal aid, effective organisation as cooperatives, finance), children (education, rights, facilities) and the land (e.g. water; organic material). Growing a local ecosystem of effective organisations: to fill specific niches, overcome specific challenges or limitations and develop opportunities; they interact to meet needs with each organism being multi-functional and manifesting the principles: observe & interact; multi-supply; small change for big effects; relative location. The Timbaktu Collective provides lessons about linking education to effective systems of organization, which are appropriate to particular social groups, and that can be used, repeated and adapted to address specific needs. b) Permaculture and agroecology education, teacher training and demonstration that relates to local needs? The support has helped give the project publicity, reach larger audiences, bolster the project’s credibility and increase the team’s motivation to continue to do regenerative work, aided by new staff members that have brought a new sense of enthusiasm into the working groups. Within 2017/18, it has also helped 12 organisations and over 300 individuals from across India to learn about the cooperative model and about implementing similar work in other areas of the country. Start date: February, 1990 – degraded land was purchased by the founders. The Collective is a Registered Society, governed by a Board of seven General Body members and five Managing Committee members who are responsible for all policy decisions. The operations are managed by the Steering Committee, Thematic Working Groups, and the Timbaktu Panchayati – the full-time functionaries of the Collective. A great deal more information on the Timbaktu Collective as a whole, including financial information, and information on specific projects that operate under the umbrella of the Collective, is all contained in the extensive and beautifully presented Timbaktu Collective 2016-17 Annual Report.